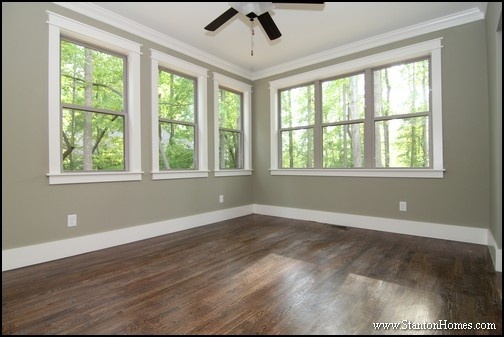 Raleigh new homes often include at least two dining spaces: a formal dining room, breakfast room, and /or casual dining the kitchen island. The seating at this island is called "raised height" because it requires stools rather than dining table height chairs. 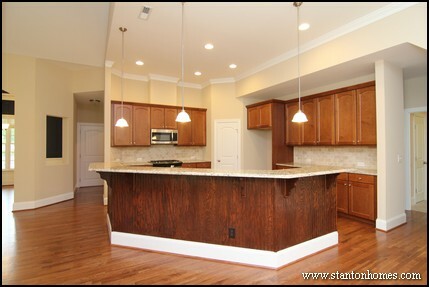 Notice the raised center of the island with counter-height sides? The center designates the seating area. Looking for new ways to add seating to your kitchen? 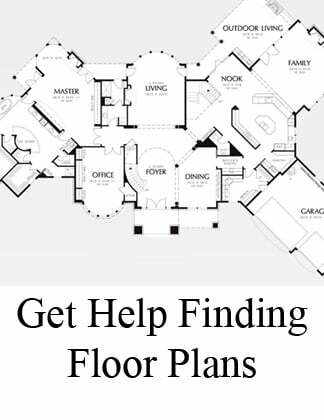 Use these kitchen layout questions -- below -- to determine how many seats you can add based on your kitchen floor plan and layout (with recommended island dimensions and average heights). 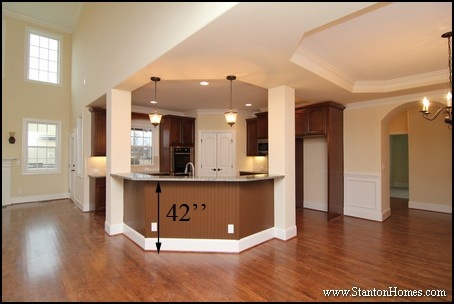 Kitchen Layout Question #1: Where is your kitchen located, relative to other rooms? 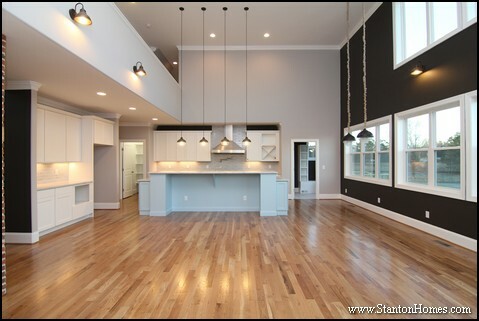 Is your kitchen separate from living and dining areas, or does it have an open concept layout? 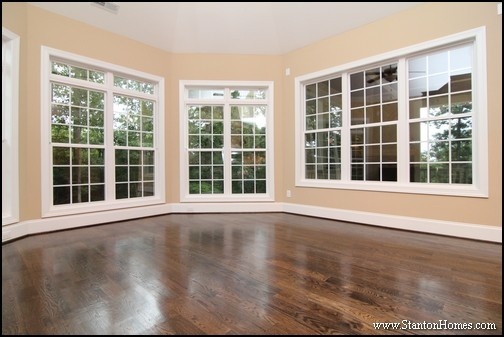 If your kitchen is located beside main living and dining areas, you'll probably need fewer seats. If your kitchen is separate, you may want additional seating. According to the National Kitchen and Bath Association, they recommend that 36 inch high islands should allow a 24-inch-wide seating space with an 15-inch-deep knee space. They also recommend that 42 inch high islands should allow a 24-inch-wide seating space with a 12-inch-deep knee space. In a seating area where no traffic passes behind a seated diner, they recommend that you allow 32 inches of clearance from the counter/table edge to any wall or other obstruction behind the seating area. If traffic passes behind the seated diner, allow at least 36 inches to edge past or at least 44 inches to walk past. These depths and widths can vary based on your layout, but are good to keep in mind. 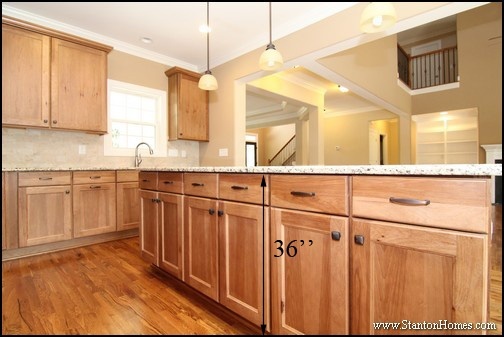 Kitchen Layout Question #2: How large is your island? Kitchen Layout Question #3: Should your chairs be hidden or visible seating? 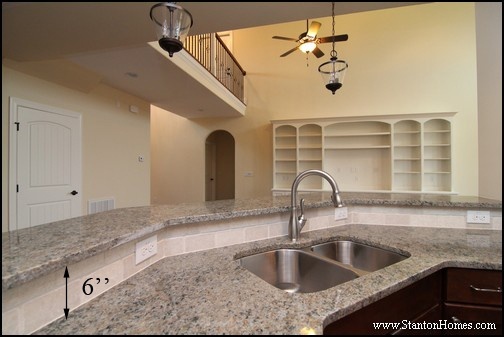 This Hickory curved island is designed to store stools underneath for hidden seating. 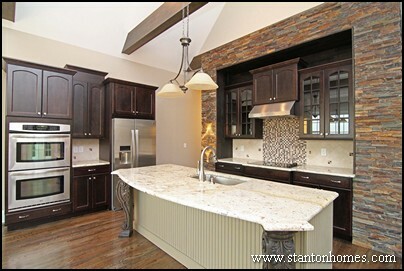 The design is enhanced with base cabinets on both ends of the islands, as well as on the back side. 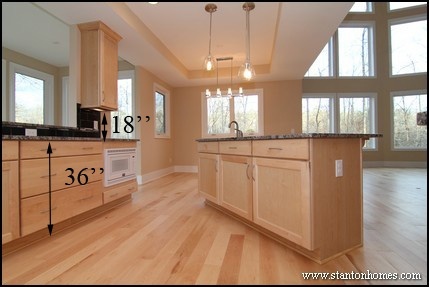 Kitchen Layout Question #4: Do you prefer counter-height or bar-height seating? Kitchen islands are taller than dining room or breakfast room tables, so you'll typically use stools to sit in the kitchen. The difference between counter-height and bar-height seating can range from six to twelve inches, depending on the home plan. Use these kitchen layout questions as a way to start thinking about design options in your new home. Prioritize your space. 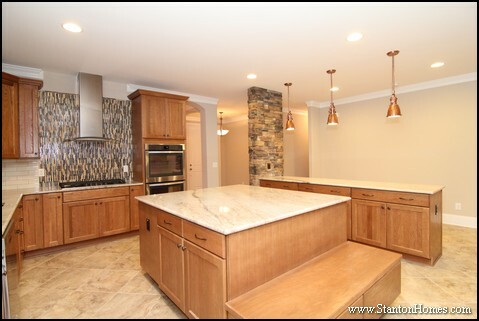 Do you need a larger (or second) island, or would you rather integrate a breakfast room table in the same space? Determine how ofter you'll cook for the family - and how often you might host a larger get-togethers. While double ovens look beautiful and balanced, you may find that the space is better saved for more cabinets or a larger microwave. Decide what you're willing to upgrade, and where you're willing to save on cost. While kitchens are one of the most important rooms of the home, they are also the most expensive, generally followed by the Master Bath. How many dining spaces does your family use? 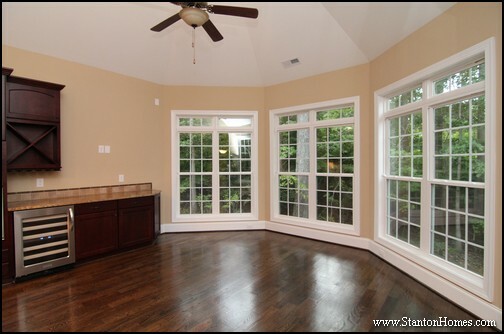 Do you want to combine or separate eating areas in your next home? Tell us which home designs stand out. 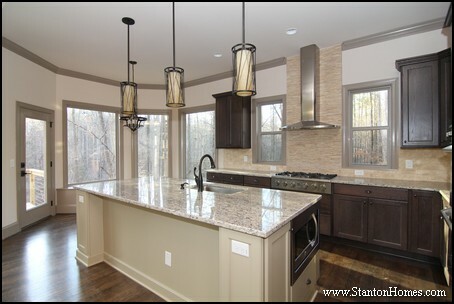 The Worthington II: See what makes this a "Baker's Kitchen"
What do you like best about the home you're living in right now - and what would you like to change? 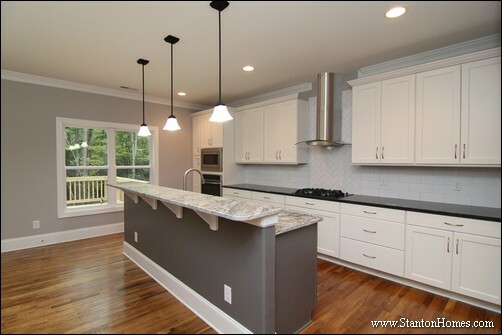 One of the top reasons for building a custom home is the ability to create kitchens, bathrooms, offices and play rooms with the kind of working space and flow you need. 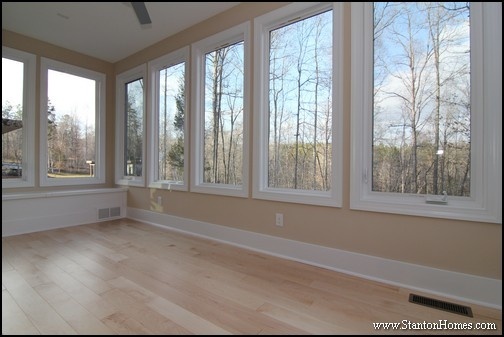 Here are some common 'must-have' updates our North Carolina homebuyers ask about. Get tips on how to make cost-effective updates, too. 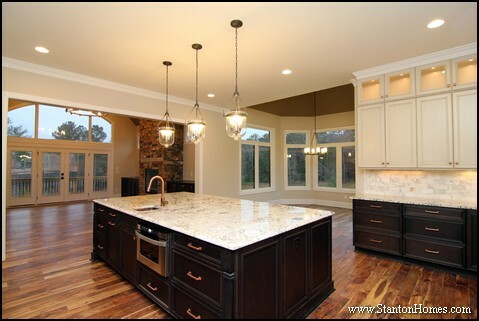 Large kitchens with an island and casual dining space continue to rank #1 on home buyer must-have lists. 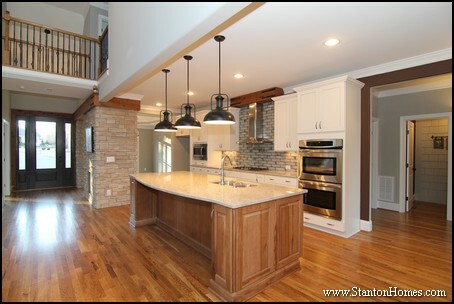 The kitchen serves as the "hub" of many family homes. When you’ve got a crowd in the kitchen, what could make it a better place to cook, work and interact? Bigger island? 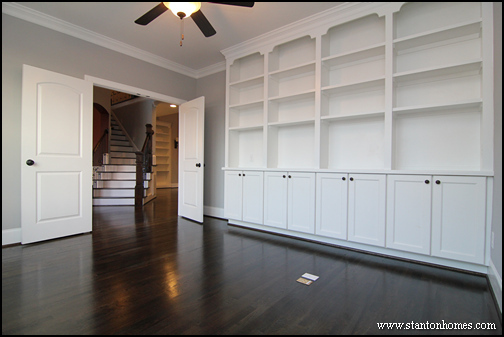 More cabinetry? Built-in seating? Often, the answer is, "all of the above!" What’s the best place to tuck in storage space? 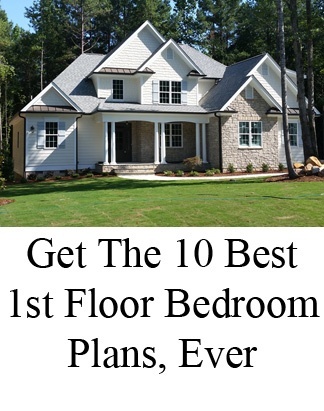 Let’s build it in now, while you’re still thinking through your floor plan. Adding just a couple of feet to a laundry room, mud room or garage can help stack in extra cabinetry, shelving, or cubbies. 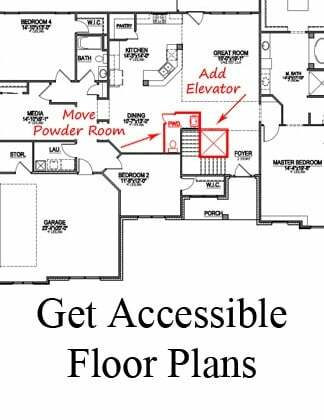 And with some plans, there’s already space to move things around without adding extra cost. Where do you want to spend your time outdoors, when you’re hanging around the house? It all depends on how the deck is stacked. 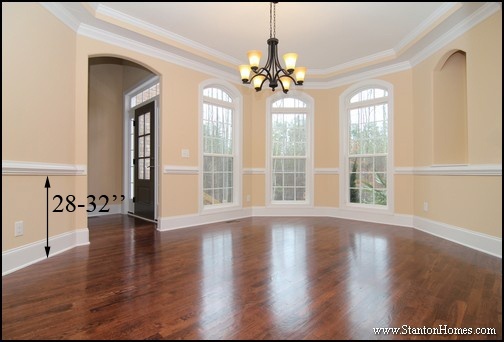 First floor living is one of the most important topics for many of today’s homebuyers. 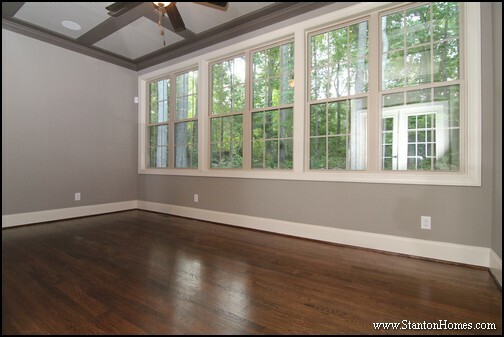 Whether your home is a popular place for guests or you’re thinking ahead to no-step living, you’ll be amazed by how many ways you can frame your master suite on the ground floor. 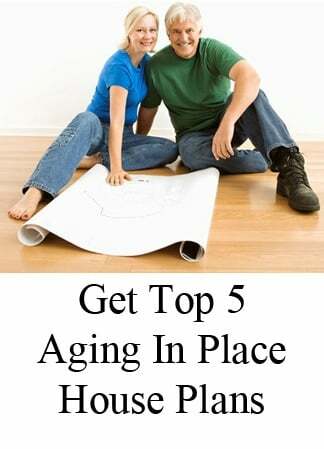 Take five, and you’ll want to linger longer when you see all the ways you can create home office space or design a work out room that fits all your gym equipment. Including a Jack and Jill or 'buddy bath' in your next home can help kids share common spaces, with the added benefit of dual access. This kid's bathroom has two bedroom entrances. 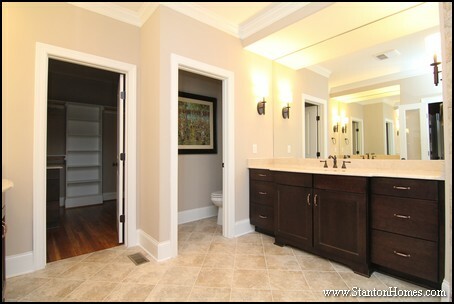 One entrance leads to the vanity room; the other leads to the shower room. A third door allows kids to share the bathroom space, an essential feature for last minute mornings. 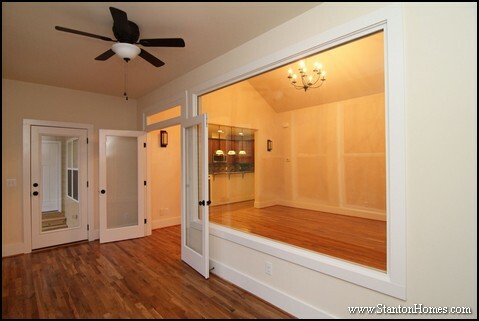 How would you modify your current home? 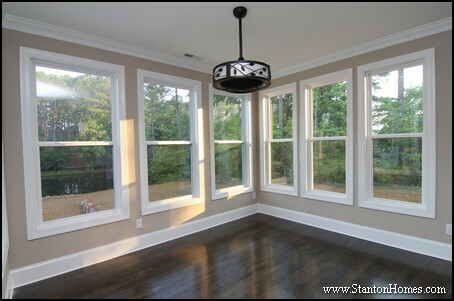 Get more ideas from recently constructed Raleigh, NC custom homes. A touch of colorful tile can make all the difference in a kids bathroom or kitchen – and it doesn’t take much out of the budget to add all that personality. Tuck in cubbies help kids learn to be organized – and help keep what they’re doing for fun from tracking all over the house. Fanciful faucets in the guest bath or kitchen can make family and friends smile, while they’re washing up. 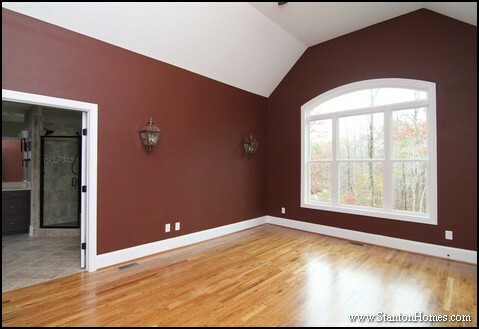 You might be surprised at how little it takes to add something special to each room of your home. 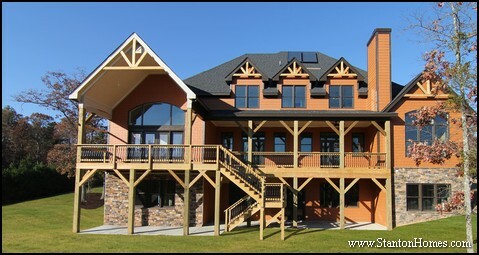 Click here to contact us now or call 919-278-8070 to talk about the custom home you want to design and build. 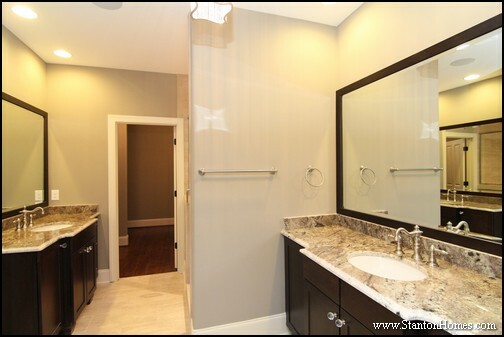 Traditional bathroom design elements include deep wood stains and finishes, wide crown molding, oil rubbed bronze, copper, brushed nickel, or chrome touches, white tile patterns, stone (marble or granite) counter tops, and framed mirrors. See what it takes to build a classic master bath - with five longstanding design elements. 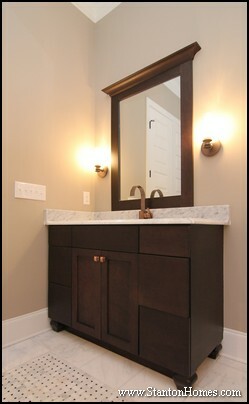 Furniture style vanities with feet add antique appeal to modern bathrooms. The dark his and her vanities offer a stark contrast against the soft, soothing tile and walls. A patterned mirror and long candle shelf - placed between two peek-a-boo windows - adds a bit of European rustic charm. 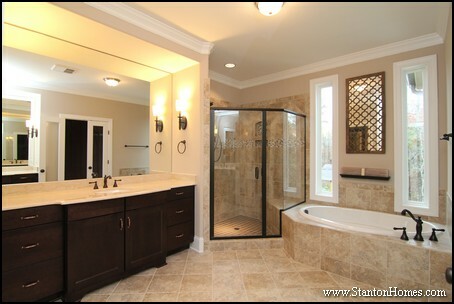 Crown molding stretches around this master bathroom, topping it with understated elegance. 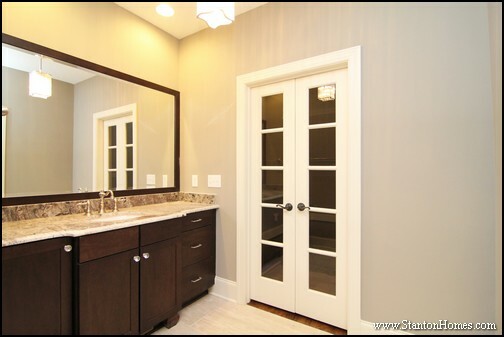 Generous mirrors fill these bathroom walls, making the abundant space feel even larger. 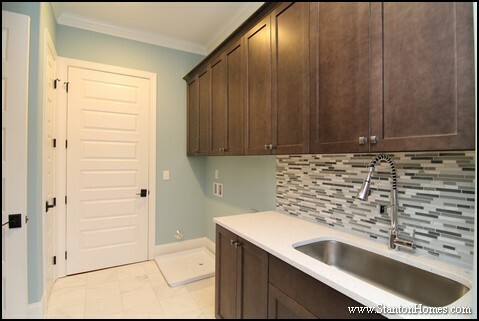 Just inside the closet, an island with matching granite top offers ample, concealed storage space. A closet island can replace the need for a bedroom dresser. While granite counter tops are a classic go-to material for master bathroom vanities, we're seeing a surge in requests for Carrara marble countertops. In this Chapel Hill custom home, the his and her vanities are topped with San Luiz granite. An Ogee style edge - a graceful serpentine curve - traces the granite tops. Cove feet support the his and hers vanities, with sink bump-outs that add depth and dimension to the classic bathroom design. Romantic crystal lights and vanity knobs are paired with alluring chrome faucets. 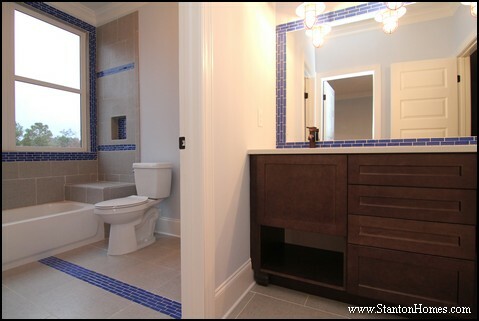 A personalized tile pattern in the shower, around the tub, or across the floor is a must-have for classic designs.